Last week, I brought up the topic of being your own coach. I talked about using an approach (or formula) to address ways of improving your own driving when you don’t have the luxury of a professional coach at hand. 1. What can you learn about applying and committing to full throttle sooner? 2. Where are you braking, and is it too early or late? 3. Are you driving the correct line for a specific corner or section of track? This week, we’ll look at these questions by using the formula, and show how you can become the master of your own driving by using this approach. Looking at this further, the question of “How is this happening?” needs to be identified. Each coach has their own way of addressing this, whether it’s old- school (such as conversation and self-assessment), new-school, where data and video will show you how things are happening, or a combination of both. We’ll take a look at a corner of a racetrack and address it using data analysis from a $400 device called an AiM Solo. The corners in question are T7 to T10 at Portland International Raceway. The what: the green lap goes from being around the same speed as the blue lap in the bottom graph (time over distance) to slower by end of the straightaway; you can see this as the faster lap (blue) is constant and the green line moves above it, indicating a slower lap time. The why: the red and blue lines are faster out of the corner, as seen from the top graph on the speed trace. As a rule of thumb, the faster you are, the lower your lap time. 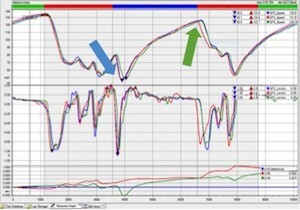 The how: the red and blue drivers are braking sooner (seen in the middle graph), as the line drops sooner, and they are on the gas sooner and more aggressively (full throttle) out of the corner. Said another way, the green line or lap was fast in and slow out and the red and blue laps were slow in and fast out. Using Image #2, you can see another example of a different approach to a corner. The green arrow demonstrates poor application of brakes. In other words, the red lap shows braking too soon into T10. Apply this to the formula. The what: the red line jumps above the green line, as seen in the bottom graph. The red line suddenly got a lot slower than the green and blue line. The why: the blue and green lines both have more speed into that corner, as seen in the top chart. The how: the red lap shows braking much sooner than the other two, as seen in the middle chart. The other way to see the same information is in a GPS overlay. 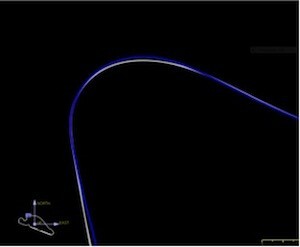 Image #3 demonstrates two laps from the same driver, attempting different lines. The white line was the fastest through here, as the blue line indicates a struggle to find the apex. This resulted in a push out towards the exit of the turn and prevented the driver from full acceleration. It’s interesting that the blue lap below is also represented in the green lap from Image #2. What if I never find a faster way through a corner, even by accident? What do I do, then? Coaching or looking at a faster driver’s data (or video) are desirable because the how is so easy to identify. If a driver is faster, then how are they doing it? Compare data, watch video, and there it is, in plain sight. The challenge is that racing is competitive and going faster is a competitive advantage. In the case of a professional driver and/or coach, their data is a valuable commodity and their intellectual property which you must purchase to benefit from. There are also other means of testing and getting instantaneous feedback. The same AiM Solo mentioned earlier allows for immediate feedback in the predictive lap setting to determine if a new line or reference point yields faster or slower times. The same can be said for any device with this feature, from AiM to MoTeC to TraqMate. The more you experiment in practice, the faster you’ll find your own way of shaving time off your laps, without necessarily the need for a professional driver’s data or someone to compare to. There's a lot in this article (along with last week’s), but I believe that with some simple equipment and the right approach, anyone can be their own coach. It all comes down to application and using time as wisely as possible at the track. Try new things, experiment with the line and your references, and above all, don’t keep doing the same thing over and over again and expect things to change. Data and video are cheap, they are simple, and while I don’t expect you to know how to read data fluently, below this article is a link to easy-to-use information to get you well up to speed. I guarantee that if you approach your driving with a formulaic approach, you’ll go faster. I would also suggest that if your competitors are going faster and faster, then yes, they might have bought new components for their car, but I would wager that many are using these new-school tools to find time they never knew was there. Never say no to coaching, but also know that if coaching isn’t available to you, you still have the opportunity to improve using similar techniques, yourself.